a sample into the spectrometer. A high-tech look into how nitrogen interacts with organic matter and decomposing crop residues in submerged soils may have confirmed the cause of a potentially serious problem facing Asia's rice farmers. Growers of lowland rice (Oryza sativa) have described significant declines in yield after several years of intensive cropping. Opinions vary, but researchers have eyed a decrease in availability of soil organic nitrogen—a key crop nutrient—as a cause. Annual cultivation of two or three rice crops in flooded lowland soils, a technique used for about one-fourth of global rice production, has been used in Asia's rice industry for more than three decades. "It's a practice that will expand as Asian populations continue to increase," says soil scientist Dan Olk. He works in the Soil and Water Quality Research Unit of ARS's National Soil Tilth Laboratory in Ames, Iowa. 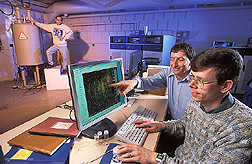 Olk and Iowa State University scientists examined the nitrogen-availability theory through nuclear magnetic resonance (NMR) spectroscopy, which allows detailed examinations of complex molecules made up of different elements, such as nitrogen, carbon, and oxygen. This technology has made possible, for the first time, direct viewing of soil nitrogen's chemical forms. They found that in oxygen-free environments such as flooded rice paddies, nitrogen bonds strongly with soil organic matter—the dark-colored, tough material remaining after crop straw and roots and manure added to soil have finished initial decomposition. The result is unusually stable forms of nitrogen that aren't readily available to the growing plants. Tests conducted on a continually submerged, triple-cropped soil revealed that—instead of being taken up by rice plants—significant amounts of organic nitrogen form bonds, through shared electrons, to chemical structures known as aromatic rings. NMR spectroscopy, which provides atomic resolution images of biological molecules such as proteins and nucleic acids, showed these aromatic rings were made of lignin derivatives that are abundant in rice soils. Lignin forms plants' woody tissues, giving them strength. Olk says the research "provides unique and strong evidence supporting the role of nitrogen deprivation in yield decline." Olk and his university collaborators, staff scientist Jingdong Mao and professor Klaus Schmidt-Rohr, examined how this knowledge can be applied toward identifying and solving the rice-yield decline. "One solution would be to aerate soil while crop residues are decomposing," says Olk. "With tropical rice fields, this process lasts about 6 weeks after plowing or tilling." He says this step can alter the chemical reactions involved in the conversion of crop residues into new soil organic matter, allowing more extended nitrogen release. "This would maintain nitrogen availability to the crop throughout the growing season." Making more soil nitrogen available to crops would lessen the need to apply it as fertilizer, which would also help the environment.—By Luis Pons, Agricultural Research Service Information Staff. This research is part of Soil Resource Management, an ARS National Program (#202) described on the World Wide Web at www.nps.ars.usda.gov. Daniel C. Olk is with the USDA-ARS National Soil Tilth Research Laboratory, 2150 Pammel Dr., Ames, IA 50011; phone (515) 294-8412, fax (515) 294-8125. "Rice Yield Mystery Solved? Key clues revealed about declines in Asia" was published in the September 2004 issue of Agricultural Research magazine.